PACKAGE THIS TITLE WITH OUR 2016 MLA SUPPLEMENT, Documenting Sources in MLA Style (package ISBN-13: 9781319090111). Get the most recent updates on MLA citation in a convenient, 40-page resource based on The MLA Handbook, 8th Edition, with plenty of models. Browse our catalog or contact your representative for a full listing of updated titles and packages, or to request a custom ISBN. Language Awareness has long recognized the power of language and helped students understand and use that power critically and carefully as they make rhetorical choices about their own academic writing. The text provides extensive support for writing, while its relevant and engaging readings grouped into topics—such as community, discrimination, conflict, and gender—explore the pervasive influence of language on our lives. “Language in Action” activities connect the everyday and the academic by examining current texts and visuals to enhance students’ understanding of the readings. 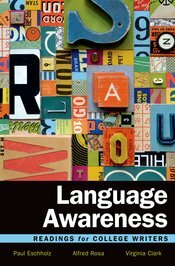 This thriving book has now been revised with input from reviewers across the country to include fresh new readings and updated instruction that invites students into the conversation about the power of language.